Ecclesiastes 4:14 For out of prison he comes to reign; whereas also he that is born in his kingdom becomes poor. Pic: Claire Palmer, after Vincent Van Gogh’s The Potato Eaters. 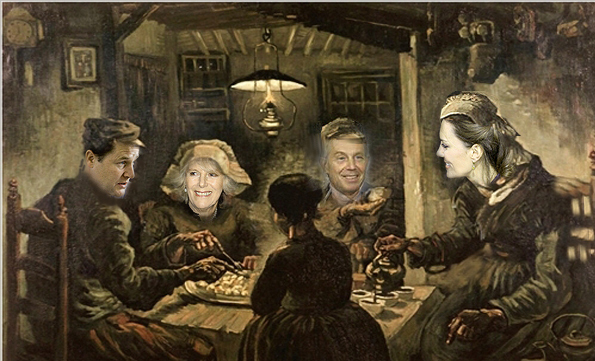 This entry was posted on 18 October, 2012 in homepage and tagged after Van Gogh's The Potato Eaters, Camilla Parker Bowles, Claire Palmer, Duchess of Cambridge, greed, Heathcote Williams, nick clegg, Sarcasm, Super Rich, Tony Blair. Bookmark the permalink.